Recently I’ve tested, how fast USB 3.0 can be with an average 2.5″ harddisc. The “Universal Serial Bus” or USB in short, was developed and introduced already in 1996 by Intel, intended as an interface for peripherial devices of any kind. 1998 the version 1.1 followed. Both versions provided a transfer speed of 12 MBit/s which was uninteresting for the use of mass storage devices even back then, although this usage was generally designated in the specification. Practically you get only about 900 KB per second with USB 1.1, so the transfer of a 50 MB file takes nearly a minute. As a comparison: My old Atari 1040STe already reached about 5 MB/s in the mid of the 1990ies on an external harddisc using an ACSI-SCSI-adapter. In the year 2000 USB 2.0 followed with an increased speed of 480 MBit/s. External harddiscs for this system where avaible by 2002 and reached about 30-40 MB per second. This standard was not changed for nearly 10 years. USB 3.0 was introduced as the successor of USB 2.0 in November 2008 by the USB Implementers Forum. But it took quite a while afterwards, until this technology was available practically as well. 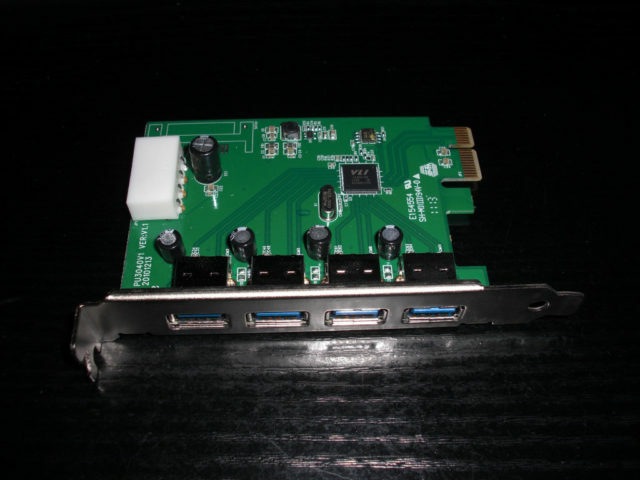 Meanwhile, in Juli 2011, USB 3.0 has arrived practically – there are mainboards, which are equipped with USB 3.0 controllers as well as controllers to expand existing computers in different variations. External harddiscs and USB flash drives with USB 3.0 are also readily available. The standard increases the maximum transfer speed to 5 GBit/s, which is more then tenfold compared to USB 2.0. Also the maximum allowed power consumption of connected devices was increased from 500 mA (or 2.5 watts) to 900 mA (or 4.5 watts), so the operation of 2.5″ harddiscs without separate power suppy is not a problem any more (also see Mini-FAQ: Using notebook HDDs on USB ports). 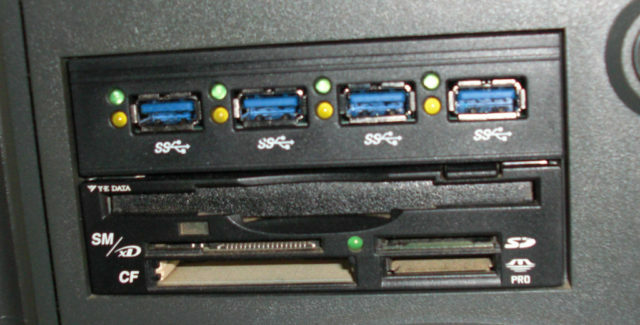 The port was also extended by five additional contacts, but due to the shape of the connector the system is downward compatible – USB 3.0 devices can be used in USB 2.0 ports and vice versa. The high speed makes USB 3.0 specially interesting for using external mass storage devices. Exactly at this aspect i’ve taken a closer look. The controller is a DeLOCK 89284. This model is based on the VIA VL800, provides four external USB 3.0 ports and is intended to be used in a PCIe 2.0 slot. An additional molex connector provides a stable power supply for the connected devices. After replacing the harddisc of my netbook with an SSD a while ago I had a 160 GB harddisc remaining – not extremely fast, but big enough to transport a larger amount of data and still faster than most USB sticks. I’ve put this harddisc into an external case, particularly an ICY BOX IB-231StU3-G by Raidsonic. Together with the case there also comes a connection cable and it is intended to be used without a separate power supply, which should not be a problem at all with USB 3.0 ports – nevertheless you can connect a 5 V power supply, if needed. The status LED lights up blue, when using USB 3.0 and red for USB 2.0. When accessing the harddisc, it flashes. The micro USB 3.0 connector is intended to be used with the provided cable, which has an extended plug – but at a pinch you can also use a USB 2.0 cable – then only a part of the connector will be used and the harddisc will of course run in the slower USB 2.0 mode only. Following is the direct comparison of the operation with USB 2.0 and USB 3.0. 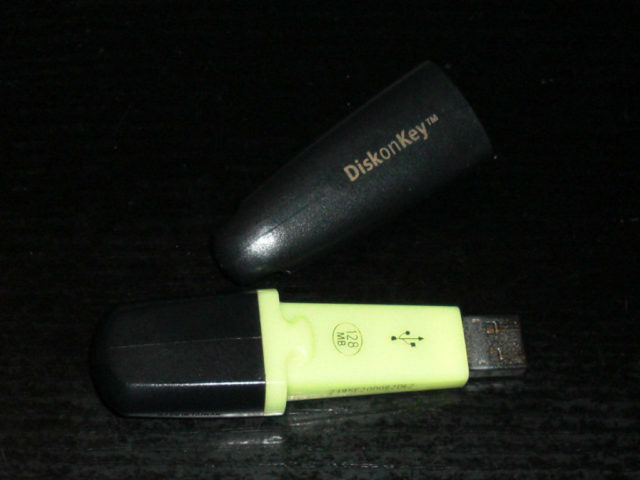 With USB 2.0 the limited bandwith is very clear – the read speed is limited to about 33 MB/s. With USB 3.0 only the harddisc itself is the limiting factor and you can clearly see the typical curve which slopes down to the end of the capacity. Although it is only a quite slow notebook harddisc, the speed at the beginning is 67 MB/s, which is more than twice compared to USB 2.0. Also the total average is still considerable higher as with USB 2.0. When using faster harddiscs you can expect accordingly higher values as the speed limit of USB 3.0 is theoretically more than 400 MB/s. The cable length is more critical with USB 3.0 as with USB 2.0 – the external harddisc was only stable with the provided cable with a length of about 80 cm. With a longer cable with 1.80 meters the harddisc was recognized, but any data transfer was aborted after a couple of seconds – also with active power supply for the harddisc. Therefore i mounted an additional active USB 3.0 hub based on a VIA VL810 in a free 3.5″ slot which is easily accessible from the front and allows a stable operation of the external harddisc.